This 14–16 July, book a Grab ride (with or without promo code) to participating Tesco stores and spend a minimum of RM100 in a single-receipt at Tesco on the same day to take part. You’ll be given the chance to grab all the groceries you can with your bare hands from a GrabCar boot in 5 seconds! 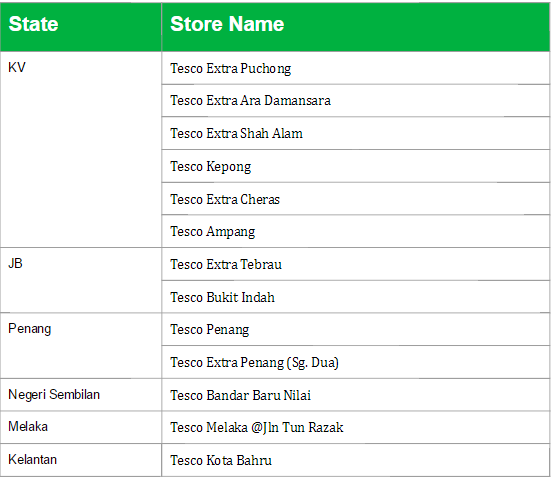 Book a GrabCar ride to the participating Tesco stores and spend a minimum of RM100 in a single receipt on the same day to participate. Grab all you can in 5 seconds with your bare hands ! This promotion is only valid for selected participating Tesco stores (Tesco Extra Puchong, Tesco Extra Ara Damansara, Tesco Extra Shah Alam, Tesco Kepong, Tesco Extra Cheras, Tesco Ampang, Tesco Extra Tebrau, Tesco Bukit Indah, Tesco Penang, Tesco Extra Penang – Sungai Dua, Tesco Bandar Baru Nilai, Tesco Melaka – Jln Tun Razak and Tesco Kota Bahru) only. Promo code discount value is excluding toll charges. The Campaign will run from 14 – 16 July 2017. The Organiser reserves the sole and absolute right to alter or end the Campaign at any time prior to the expiry of the Campaign Period without giving any prior notice and no compensation in cash or in kind shall be given.